We love traditional salads, but sometimes we want to try something a little more unusual. This creamy salad looked a little strange at first, but once we tried it we quickly found out how full of flavor it is. It’s easy to make, and the green peas pack in nutrients while giving it an appealing burst of color. We get requests for this salad all the time when invited to get-togethers; once people try it once, they’re hooked! Mix together ranch dressing, Dijon mustard, sour cream, salt and pepper in a small bowl until completely blended. Set aside. Cook bacon in a skillet over medium-high heat until browned, then chop and set aside. Bring a large pot of salted water to boil and add the peas. Cook 1-2 minutes, or until just tender, then run under cold water to cool. 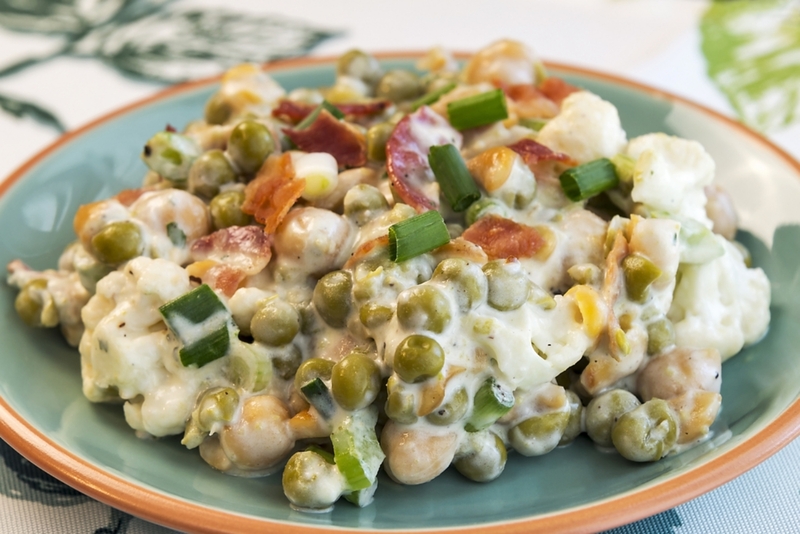 In a large bowl, combine peas, chickpeas, celery, green onions, cashews, cauliflower and bacon in a large bowl until well mixed. Add the dressing and mix until everything is evenly coated.